There’s a new king of the mountain when it comes to high school basketball in southern Nevada and its name is Bishop Gorman. The defending state champion Gaels (17-4) needed overtime but they finally found a way to knock off old nemesis Findlay Prep, 76-72, on Saturday afternoon in the Findlay Big City Showcase at South Point Arena. Nick Blair’s driving layup just beat the buzzer to send the game into overtime and 7-foot junior center Stephen Zimmerman sealed the win by sinking two pressure-packed free throws with 7.7 seconds left in OT as Bishop Gorman won for the first time in seven meetings with the three-time national prep champion Pilots (21-4). Senior point guard Noah Robotham was named game MVP after scoring 25 points, including 13-of-15 free throws for the Gaels. Zimmerman, regarded as one of the top three prospects for the Class of 2015 by most scouting services, chipped in with 13 points and 12 rebounds while guard Obim Okeke added 12 points, including five in overtime. Blair (10) also finished in double figures while Chase Jeter added nine points, eight rebounds and four blocks before fouling out in the fourth quarter. Bishop Gorman looked like it might blow out the Pilots at the start, racing to a 13-0 lead in the first six minutes en route to a 27-21 halftime lead. 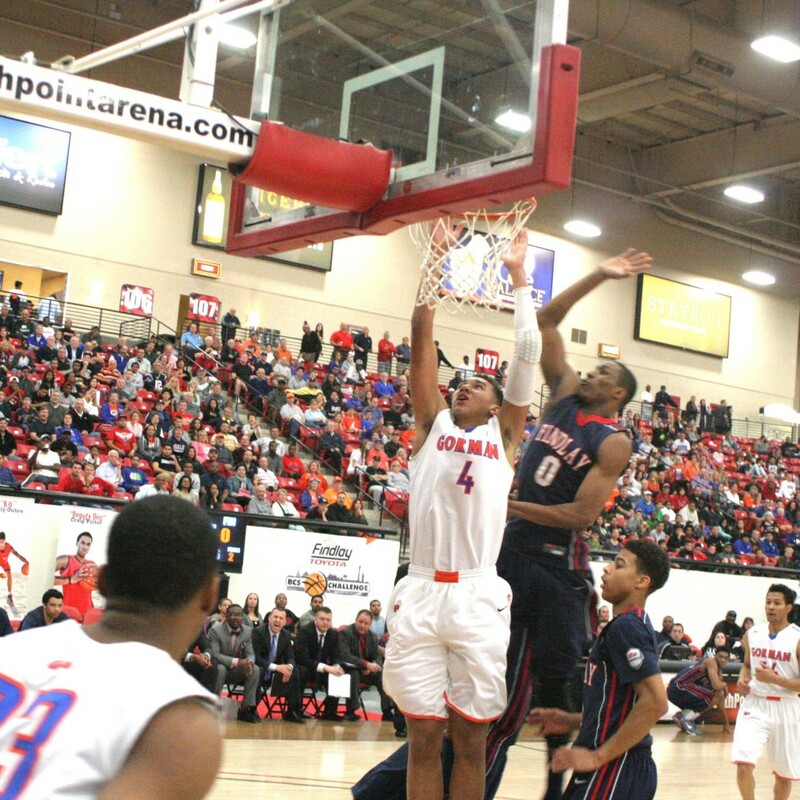 The Gaels led by as 13 points, 44-31, late in the third quarter before Kansas-bound wing Kelly Oubre and senior guard Rashad Vaughn – both top 10 nationally-ranked recruits for the Class of 2014 – got going. Oubre, who ended the third quarter with a 3-pointer at the buzzer, scored 10 of Findlay Prep’s 30 fourth quarter points while Vaughn, arguably the nation’s top shooting guard prospect, added six points, including a 3-pointer while falling into the Pilot bench with 47 seconds left that gave Findlay Prep it’s first lead, 59-58. The teams traded free throws after that and it looked like the Pilots were in good shape for a comeback win when sophomore guard Ray Ona Embo went to the line for two shots with Findlay Prep up, 63-62, with 11.8 seconds left. Ona Embo hit his first free throw but missed the second and Zimmerman grabbed the rebound. Rice, trusting the instincts of his senior point guard Robotham and not wanting to give the Pilots a chance to set their defense, shunned a timeout. The ball eventually found itself in the hands of Blair, a 6-foot-6 junior forward, who took it to the basket for a game-tying layup just before the buzzer sounded. In overtime, the Gaels gradually pulled away to a 74-70 lead thanks in part to the play of 6-9 sophomore forward Zach Collins, who nailed a 3-pointer and powered in a layup that gave Gorman the lead for good, 72-70. Free throws by Okeke and Robotham extended the lead to 74-70, but Oubre answered with a drive to the basket to make it 74-72. That set the stage for Zimmerman, who sank his two free throws to clinch it.